Not too long after Mr. Scrummy and I first met, I decided to cook him a meal. In my mind, it was going to be so delicious. And (bonus) so easy to ‘throw together’ as well. Sweet potato gnocchi with some kind of sauce – mushroom as I remember. A-hem. You can probably guess what’s coming. Yup, it was absolutely disgusting. My over-confident self, having made gnocchi a couple of times before reasonably successfully, had decided not to bother with a recipe this time. I mean, what could possibly go wrong? Just cook the sweet potato, add an egg and some flour and it’s done. Except that I really didn’t need to add as much flour as I thought. In theory, this meal had so much potential but all we could taste was flour. I think we both managed about four or five forkfuls each. Yucky yuck yuck. I think we can all relate to this scenario. You have an idea in your mind about how something might work out, food related or otherwise, but the reality is something totally different. Just thinking off the top of my head right now, I can think of the time a friend asked me to trim his hair. I thought it would be OK, but it was absolutely terrible, poor guy. All uneven & lopsided. Oops. Then the big one is that I never expected in a million years to marry an Australian followed by spending a lot of time in planes travelling backwards and forwards halfway across the world. Going back to food with too much flour in it, just this last weekend I made some sort of zucchini pecan muffins that were wonderful in the ‘envisaging’ stage – so moist and healthy and flavourful. In reality, they were so dense and … well, ‘floury’ … that they reminded me of that scene in the Hugh Grant film, About a Boy, when the young boy throws his mum’s bread into the pond and it’s so heavy that it kills a duck. I just ate another one to try to convince myself that they’re actually OK, but no, they’re really not. In the bin they shall go. Of course this kind of ‘food flop’ is always disappointing, especially after you’ve researched a little, trotted off to the shops, spent ages traipsing the aisles looking for the ingredients, spent even more time clattering around the kitchen and outside taking photos and then had to clean up the disaster area of a kitchen you’ve left in your wake. When this happens to me (rather a lot lately) I just console myself with the fact that I can probably make an entertaining post out of all of these ‘misses’ at some point. Some point rather soon if I keep on with all this flopping! 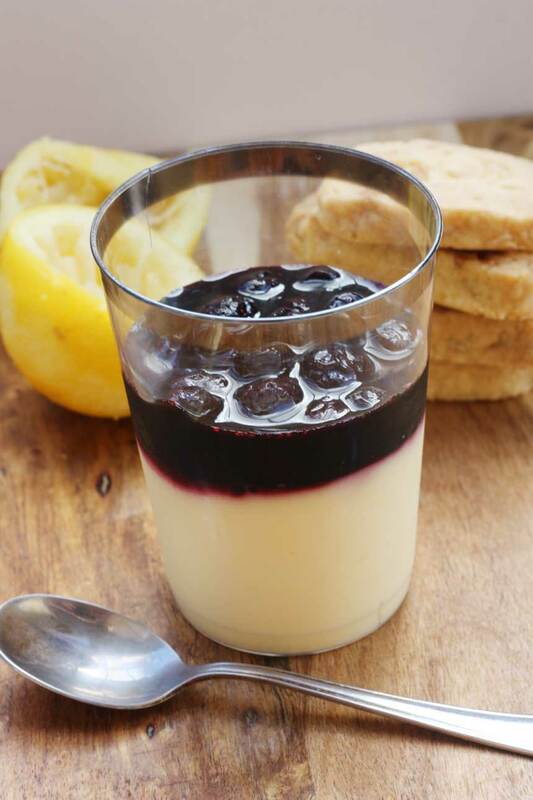 Aaanyway, what I’m leading up to is to slightly boastfully tell you that this lemon posset with blueberries & macadamia shortbread is one recipe that will thankfully NOT be added to the ‘flops’ folder. I had never made a posset before, I was a bit pressured for time and I was making this to take to a dinner with friends so needed it to taste OK. Thankfully, this did end up exactly how I’d hoped it would. Phew. ‘So what on earth is a posset?’ I can imagine you asking. Well, apart from being a very old dessert, apparently dating back to medieval times, basically it’s just thick cream that’s heated with sugar and lemon juice and zest and then left to set in the fridge. That’s really it. I was worried the whole time I was making it that it wouldn’t set. I mean, there was no gelatin or thickener of any kind in it, so how could it? Well, apparently it’s the acid in the lemon juice that does the trick. I also thought it might curdle when I added the lemon juice to the cream, but no. Because of the high fat content of the cream, this doesn’t happen either. Double phew. The resulting dessert is rich, creamy, silky, tangy and, yes, nicely set! I decided to add a simple blueberry layer that I made by heating blueberries with a little sugar for a few minutes. I also decided to make a quick macadamia shortbread to dip into the posset, which I was particularly pleased with. This is probably one of the simplest ‘impressive’ desserts you could ever make. You could have this made and in the fridge in less time than you could run to the shops to buy a dessert. The shortbread took hardly any time to make, as well, but if you wanted to keep things even simpler and use shop bought then of course that would be fine. 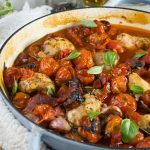 The only thing you need to consider when making this is to make it well before you want to eat it, because it really needs to be in the fridge for a good four or five hours to be properly set. Also … just one little note about the shortbread. At first I thought that this was going to be added to my ‘fails’ list as well. The dough was extremely crumbly when I tried to bring it together but kneading it a little in several batches seemed to make it easier to handle. It’s definitely worth the extra few minutes of work for the lovely buttery, crumbly, nutty shortbread you end up with. So … had any food flops lately? What about your food successes? I can’t wait to share my food flops with you someday soon, but for today I am happy to be able to share one of my great food successes! Enjoy! 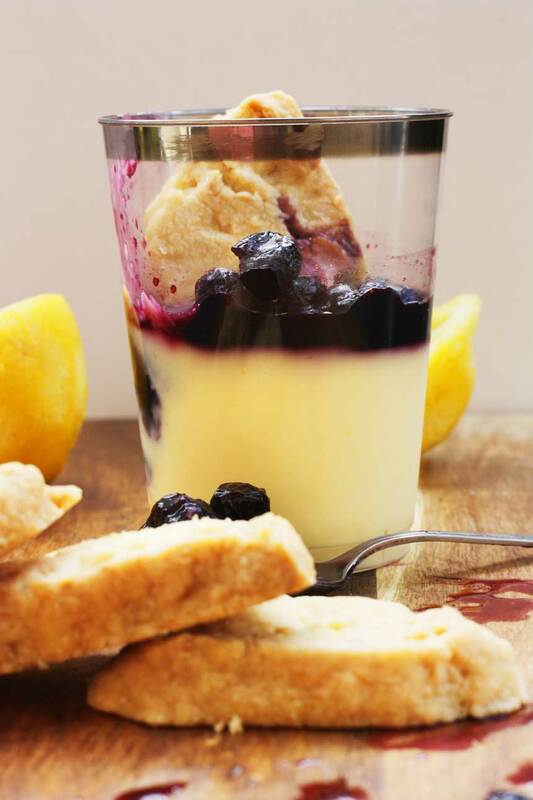 Beautifully creamy and tangy lemon posset with a light blueberry compote layer on top. 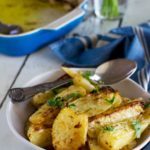 Served with buttery, crumbly macadamia shortbread biscuits. 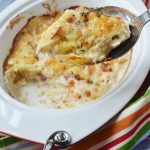 A perfect easy dessert for dinner guests. Pour the cream into a medium-sized pan and bring it to the boil. Add the sugar and lemon juice and zest. Simmer gently for about 3 minutes, then take the mixture off the heat and let it cool for about half an hour. Pour the mixture into ramekins or glasses, cover with plastic wrap and put in the fridge to set for at least 4 to 5 hours. Meanwhile, put the sugar into a small pan and heat it until it melts. Add the blueberries and cook for about 5 minutes until you have a compote. Take it off the heat and let it cool. 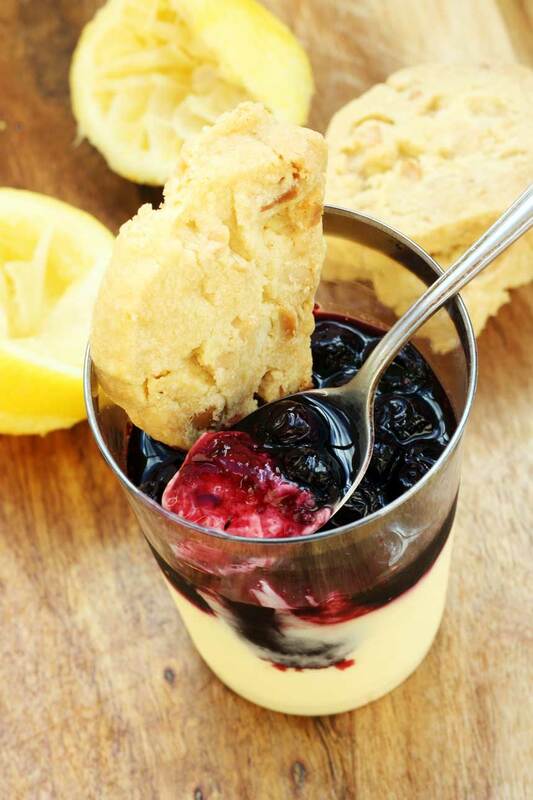 Just before serving, spoon a thin layer of blueberry compote on top of the lemon posset. Cream the butter and the sugar together with a handheld whisk, then work in the flour and macadamia nuts with a wooden spoon. Turn the mixture out onto a board or clean work surface and gather it up into 3 balls of dough. Knead each dough ball a little until it will come together. Roughly shape each ball into an oblong and then cut it into about 1-cm wide pieces with a sharp knife. You will end up with rough half-circle-shaped pieces of dough. Place the uncooked shortbread pieces on a baking sheet lined with baking paper and bake for about 15 to 20 minutes or until the shortbread is a light golden colour. Leave the shortbread to cool on a cooling rack. To serve, pop a piece of shortbread into the top of each pot of dessert. Delicious! Lemon posset & blueberry compote recipe barely adapted from this recipe from the blog The Game Bird Food Chronicles. Macadamia shortbread adapted from this recipe on bestrecipes.com.au. 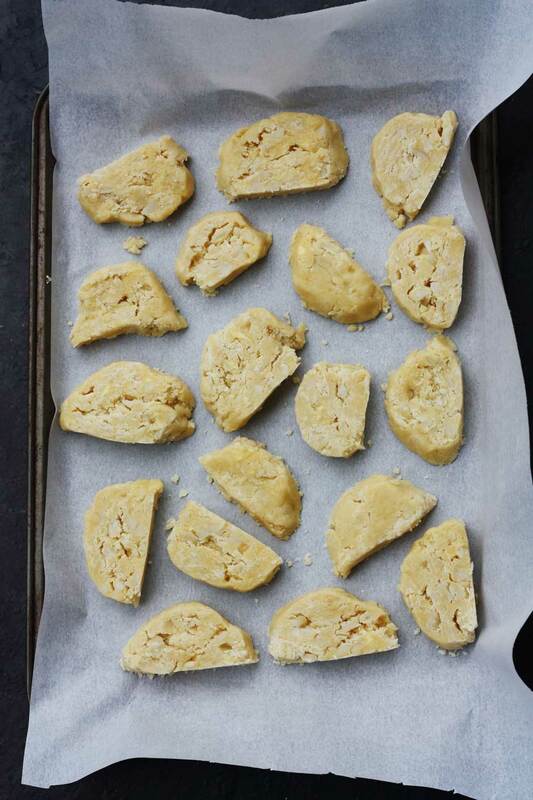 Don’t worry if your dough takes a while to come together when making your macadamia shortbread. Mine was still a little crumbly when I put the shortbread on my baking tray, but I just pushed it together with a knife and it was fine. I hope you enjoyed this post! You can subscribe to receive posts directly to your inbox by entering your email address in the box at the bottom of this page or at the top of the sidebar on the right. I’m glad this wasn’t a recipe flop because it looks amazing, Helen! 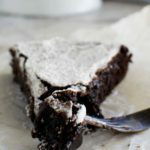 Definitely a simple dessert that will impress anyone! I’ve actually never heard of posset before, but I’m assuming from the ingredients that it’s very similar to a custard or pudding. And the home-made shortbread sounds amazing, too! It is a little similar to a pudding, I guess – basically it’s just slightly set, flavoured cream. A lot more impressive-looking than the skill needed to make it, which is basically none! So glad you like it, Gayle! I’ve made many a disgusting meal in my day. I’m still far better at baking than cooking but I’ve come a long way! Loving everything blueberry and lemon lately. Thank you, Melanie! I’m the opposite to you, a better cook than a baker, but I’m enjoying experimenting a little with desserts. I think that we have to go through the flops in order to have the successes. That’s the way I like to look at it, anyhow! J’ai en envie tout suite de ce délicieux dessert! Il pareil tellement frais. J’aime bien aussi la gourmandise du sablé au macadamia ! Well, I’ve never heard of a posset before! But that doesn’t mean I’m not eager to try it. Lemon & blueberry of course is just wonderful. But that macadamia shortbread sounds absolutely amazing! Macadamia nuts are my ultimate weakness. This truly sounds amazing. Will be pinning and sharing because more people need to know about this so they can make it and not have a flop! Your inventiveness (is that even a word?) never ceases to amaze me and today’s recipe is no exception. Helen has flops?!? gasp. I don’t believe it! If you want flops, pop over to my house! I love macadamia nuts, too … my favourite! Thanks so much for pinning and sharing, Laura – that really is so sweet of you. And you’re always so so complimentary. Believe me, I have sooo many flops – possibly more flops than successes! But even the folks on Masterchef have flops, so I’m not too worried. Thanks again, Laura, and have a wonderful day! Helen, you’re always making me laugh. The gnocchi, the haircut, and I guess I missed that movie About A Boy because the dense bread killing a duck? I had to laugh because I’ve made bread like this. 🙂 This dessert looks perfect — creamy, fruity, and with a crunchy shortbread cookie? I would love having one of these today! Aw, thanks Marcie! You just made my day with this comment. It was a pretty nice dessert – sort of light, rich and delicious all at the same time. If you were closer I would definitely invite you over and make you one of these! I’ve made a few flops – more than I like to admit. But this certainly isn’t a flop. It sounds so good. To me, this is the perfect dessert. Thanks so much, Norma! You’re right, it is the perfect dessert. Mainly because it’s so fast to make! Helen, you are not alone with having flops. I’ve been trying to create smoothie recipes, and it seems like each time I have to change something about them. I prefer to think of at least the salvageable flops as trial and error, part of a process. Hopefully we learn from our flops. Which reminds me, I made gnocchi once. They basically came out okay – kinda sorta – but I ended up throwing most of them out and would be perfectly happy if I never again ate gnocchi. And especially not ever making them again. They are not worth the effort. Hi, Susan! I’m so happy to hear that it’s not just me that has food disasters. I like your way of looking at them, though – that they are part of a learning process. They certainly are! My biggest disappointments are when I’m wanting to post something on the blog and I know it still needs work before I can do that. As for the gnocchi, I’d actually like to have another go, but you’re right that they take a little bit of work to make! I will not even dare tell you about my recipe flops. Seriously. Love lemon posset. never had it with blue berries though. I think that the posset is wonderful without the blueberries, but I just thought I’d try it with. Great both ways, I think! i have never had a posset before! definitely something i need to go out and try, that shortbread looks so delicious also – love the macadamia. yum! Haha,I’ve made lots of meals that “in my head” would be fantastic and they turned out not so great. My husband is way to kind and is always willing to give everything a try. 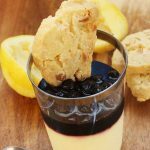 I’m loving this lemon posset with blueberries. This is my kind of dessert! It’s comforting to know that I’m not the only blogger who has flops! Unfortunately though my hubby is very honest and always tells me when something’s awful .. haha! Glad you like the dessert, Cindy. Thank you! Recipe flops are the worst! Especially on a special occasion such as making a fancy dinner for your mister. I’m sure you’ve made up for it since, with all the yummy recipes you post here! 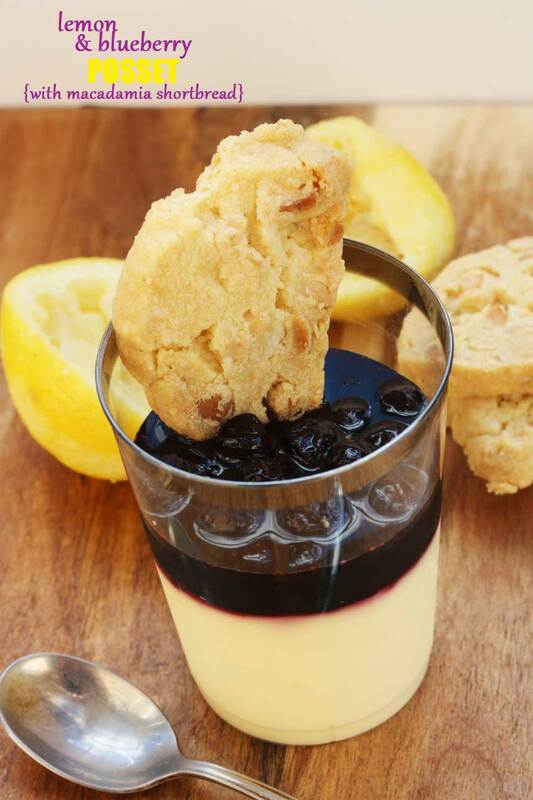 Like this lemon posset with blueberries and macadamia shortbread. Yum! Oh Helen, I cracked up reading this post! Especially with the bread-in-pond thought. Haha! My latest flop was a few days ago when I attempted a focaccia recipe and it barely rose at all. Edible, but not the fluffy delicious focaccia I was dreaming of. This dessert looks fabulous! I had never heard of a posset, but it looks so tasty! 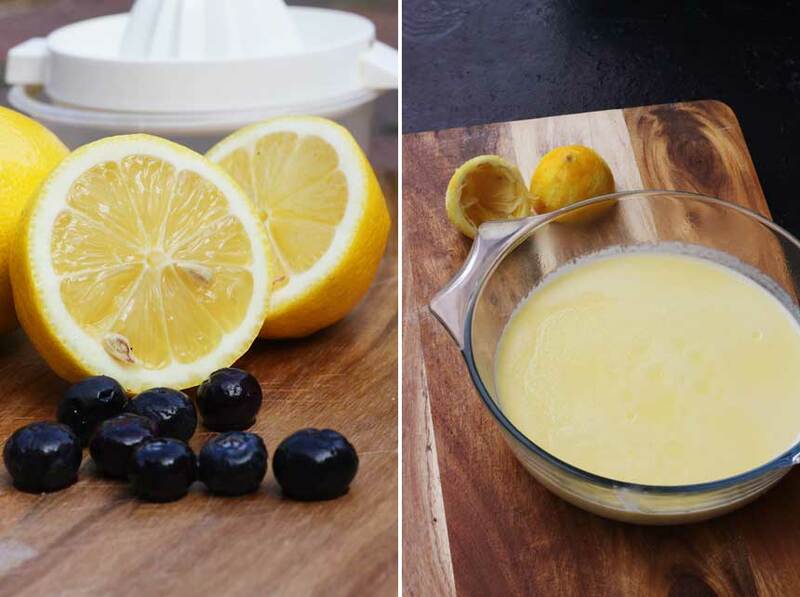 Love lemon + blueberry together. Plus this shortbread? Mmmmm. I’m wishing I had some now to snack on! Hi Helen, beautiful dessert, never heard of it before but now thanks top you I know what a posset is. And yes I have had so many disasters, I remember one time boiling eggs for a potato salad, time must of got away I heard a strange noise, ran out to the kitchen to find a empty pan and about the same time a egg dropped from the ceiling. Ooops! Hahahaha! Thanks for the giggle, Cheri – that’s hilarious! 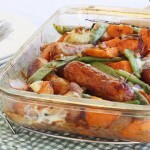 I think food disasters go with the territory when you’re a food blogger! Oh what a shame about the gnocchi. I’ve found sweet potato and pumpkin to be really hard to make into gnocchi. I think they’re too “wet” or something and I end up with stodgy weights! This lemon posset looks entirely delectable though! Glad you like the posset – and know what it is! Hahaha … yes, I think I would have to admit to having blogged a few flops too, Tandy!! Lemon and blueberries go so well together. This looks really good (great photos too by the way). What a great idea! I love the step by step pics, they really do help wen attempting to make the recipe. oh Helen, they look delightful! I need to give it a try. Last week I´ve made your panini recipe and it was amazing! 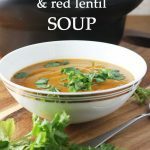 So easy and simple, really delicious. Thank you for that! Hi, Karla! You can’t imagine how excited I feel right now that you made my panini … blush, blush! And of course I’m delighted that you liked it so much! Mmm… spaghetti with salmon sounds absolutely wonderful! Don’t you just hate recipe flops? Apparently I am not a very confident person because they make my question my entire identity! ha! But I think this sounds wonderful! I love when old cooking methods or recipes are reintroduced. I am so glad you shared! This is such a gorgeous and elegant dessert. I had no idea what a posset is, until now. It is so simple and delicious. 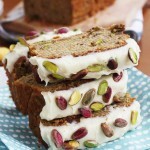 Thanks for sharing this wonderful recipes! can’t wait to give it a try. Thank you so much for saying so, Arpita. I guess it is quite elegant (blush). I’d heard of a posset (because it’s English, I guess) but had never tried it before. I hope you do get around to trying it, too! Oooh … strawberry rhubarb crumble sounds divine! But that’s even more of a disappointment, isn’t it, when a recipe flops and it sounded so good! At least the taste was good … imagine how great it will be next time! Do try the cookies … I was really really pleased with them! 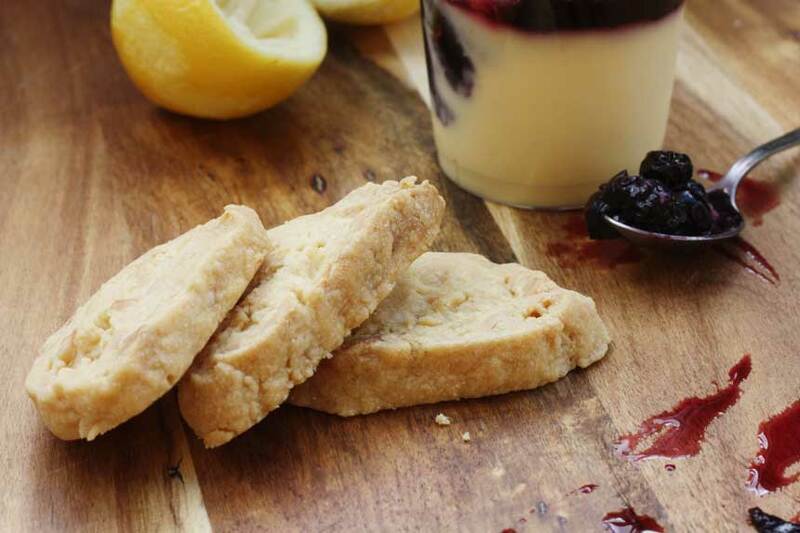 This dessert looks delicious, macadamia shortbread sounds absolutely amazing! I am a Macadamia . . .well, nut! Love them and this looks fantastic! And, the whole flops business, I could fill many boxes with those! At least we are learning and trying but it is amazing I have the guts to step back in the kitchen sometimes! Bahaha oh my gosh the first time I cooked for my husband (back when we were just dating) … holy cow was it disgusting!! He was such a good sport and ate it … even though we should have dumped it all!! This sounds awesome – I definitely want a few of those macadamia shortbread cookies! 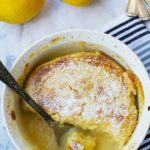 My goodness, I can certainly relate to having a share of culinary disasters, and to be honest I’ve often thought about making lemon possit, but feared just that. I think you’ve inspired me to finally give it a go though, since lemony desserts are my absolute favourite. 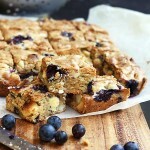 Loving the idea of the blueberry topping and shortbread too. So glad you like this! I think I have almost as many flops as I have successes, but it’s good to know I’m not the only one! I LOVE shortbread! Love the beautiful flavours you have gone with here. Would be just divine! Haha, I can totally relate to that! When my husband and I first started dating I wanted to cook him some pasta, which is pretty much the easiest thing ever to cook, but somehow it was overcooked and mushy and not good! I was so embarrassed and I’m sure he thought I was a horrible cook, thankfully he kept me around! I’ve never heard of posset before, but I want some right now! I bet it is delicious with the blueberries an shortbread! What a great combo, Helen! Also, now I’m also wanting some sweet potato gnocchi! Oohhh nooo … well, I can totally relate … it must have been true love, Isadora!! Yes, you can e-mail me at [email protected] I don’t think I got the other one… I look forward to your e-mail! I had never heard of a posset! I’m ready to bake and eat them though! 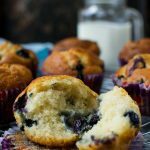 Lemon and blueberry is such a classic summer flavor combo you really cannot go wrong. I understand you completely on the too floury problem … I’ve not tried making gnocchi but I’ve definitely overdone muffins. So disappointing, especially when you made special trips to the grocery store! You did a beautiful job with these Helen! Hope you have had a lovely weekend! I am not stranger to food flops – just recently I was trying to perfect baked overnight oats and the first time I made overnight oat bars they were simply too too moist – soggy is the word my daughter used! So glad you like it, Shashi! I guess this is a bit of a two-in-one dessert! Bonus! You’re so right about the food blogging thing being a huge learning adventure. I have a feeling the flops won’t ever end, but never mind! Thanks for telling me about your overnight oats – that makes me feel a bit better about my flops! Yup, I had one food flop not so long ago :(( Buuuut on the great side I developed a mean recipe for today so it’s all alright! It doesn’t look quite as good as these possets though. Yummm they sound delish! Honestly- I’m amazed it set as well! Though I always feel that way, even with custards and such that have eggs to bind. And I also have your shortbread problem….always seems too crumbly. I’m glad both worked out so well for you! This looks great! I’d never heard of a posset before – the things you learn! Hi, Claudia! Thanks so much for passing by. Oh yes, the things you learn indeed! So glad you like the posset! I’ve never heard of a posset before but it sure does look delicious! We are the same page yet again, my firend…guess who has a blueberry parfait coming up on her blog? 😉 Great minds think alike. Oh and I simply love how you added the shortbread. Shortbread is awesome. 🙂 Have a lovely weekend!